Spider-Man is the quintessential young hero, complete with snarky one-liners and human struggles as he strives to come to terms with the responsibilities that arrived alongside his powers. Bitten by a radioactive spider as a teenager, science whiz kid Peter Parker left his normal life behind when he donned his blue and red costume. From that point on, this masked hero began slinging through the city on cords of spider web, fighting crime as he went. 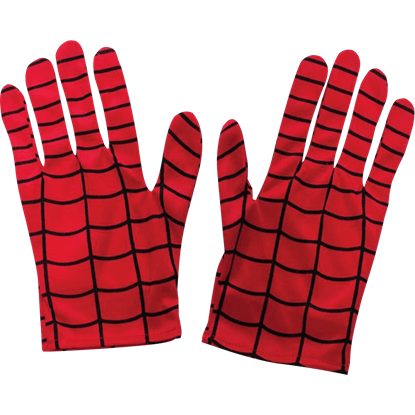 As one of the most beloved Marvel characters of all time, Spider-Man has a huge fan base, and here at Superheroes Direct, we provide the highest quality collectibles to all fans of this arachnid-themed hero. 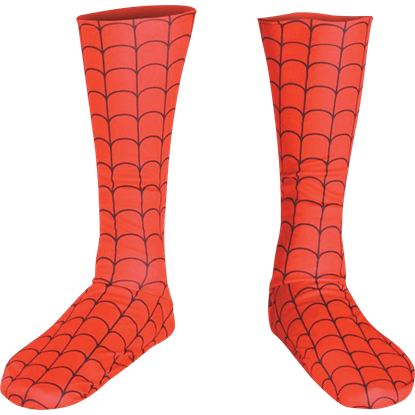 Our selection includes Spider-Man t-shirts perfect for any enthusiast, as well as drinkware and cookie jars to decorate any home. Playing cards, key chains, statues, POP figures, and more sure to delight any Spider-Man collector. 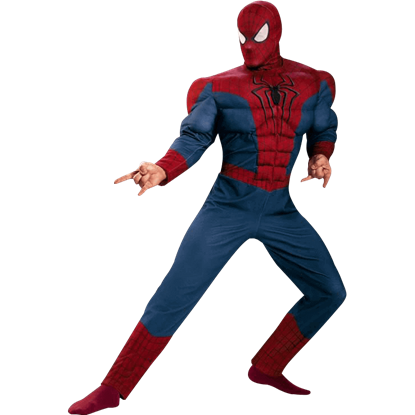 Swinging from building to building through the New York skyline has got to help build muscle, and the Adult Deluxe Spider-Man Long Sleeve Costume Set shows off the superheros super physique with eye-catching, padded detail. Make this item the final piece of your next Spider-Man costume for Halloween or a dress-up party! 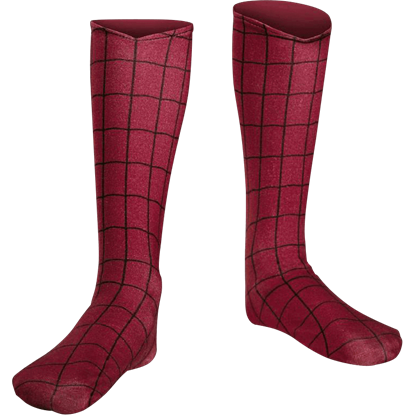 The Adult Marvel Spider-Man Boot Tops make a great addition to other web-slinger attire to create a polished look. 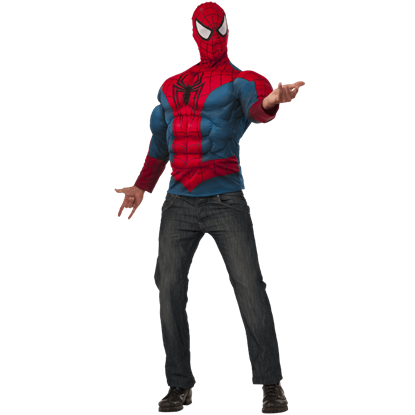 One of the most popular comic book superheroes of all time, Spider-Man makes a great choice for your next Halloween costume. 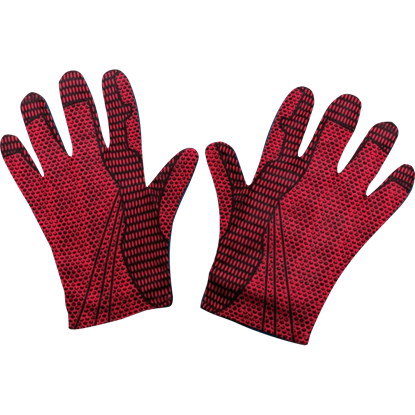 The Adult Marvel Spider-Man Gloves add the ideal level of detail to your fantastic ensemble. Reinvent the superhero costume with this stunning Adult Spider-Girl Corset. Perfect for themed parties or conventions, this costume corset features the classic webbing and spider logo worn by Spider-Man and his daughter Spider-Girl. Spider-Girl is the daughter of Spider-Man, and picks up the crime-fighting mantle when she develops powers. 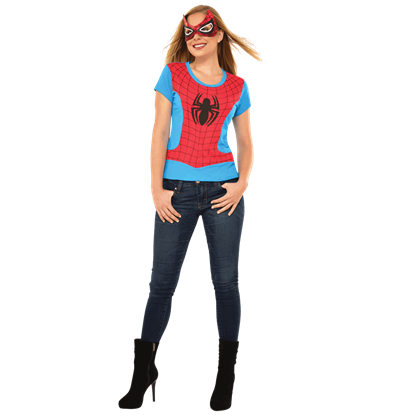 As a casual costume or for the ultimate spider-fan, this Adult Spider-Girl Costume Top and Mask knocks it out of the park. Show your love for the friendly neighborhood web slinger in a sleek silhouette. This Adult Spider-Girl Rhinestone Tank Dress is perfect for a themed costume party, superhero movie premiere, or your favorite cosplay convention. Add shine to your Spidey costume with this Adult Spider-Girl Rhinestone Top and Mask. Perfect for trick-or-treating with your kids or attending another costume event, this licensed superhero shirt gives a new twist to your outfit. Add pizzazz to your superhero costume with this Adult Spider-Girl Sequin Corset. Inspired by everyones favorite web-slinging family, this costume corset will help you shine at your next superhero movie premiere or themed event. When you are looking for a no-fuss costume to celebrate your favorite web-slinging superhero, this Adult Spider-Girl Tank Dress will activate your spidey senses. Wear this costume dress to a themed party or any superhero event.